Well, kids, I had tons of ideas for other ornaments and decorations and lovely new things I wanted to make before Christmas. But my ambition did not quite correspond to the amount of free time I have. Too many graphic design projects to finish before we head out of town this week. 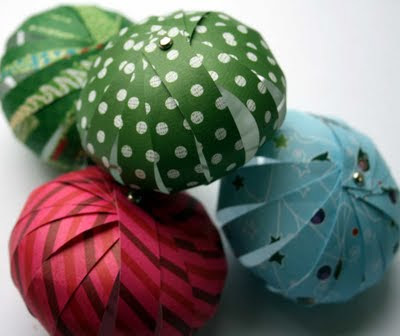 But during my internet travels I did come across these nifty paper ball decorations, complete with instructions. Nice work, anonymous blogger at The Creative Place. This just in: A shortcut to making these. Thanks, Whitney! Simple and lovely. I saw something similar just today on Photojojo, using photographs! Would be a wonderful use for those landscape/garden shots that don't quite look like you expected. :-) Happy trails to you as you set off on holiday; merry merry! Those are adorable! I can't wait to make my own! LOVE these! If anyone is interested I created some pdfs a while back with the strips all measured out so they can be printed on the back of 12"x12", 8"x8", or 8.5"x11" sheets. Saves some time measure each time! Fab. I edited the post. I've made these several times, and heart them very much! I've made pumpkins from orange paper with green pipe cleaners, apples with red paper and brown pipe cleaners, large ornaments with tassels hanging from the bottom...well, you get my point. I used these, strung in random groupings on fishing line as a decoration for a wedding shower and they were a huge hit over the food table. I used one of those books of scrapbooking paper which meant everything was nicely color-coordinated already for me. neat! I bet my daughter would LOVE to have these hanging in her room above her crib. Gotta try 'em out ... after the holidays though. You really come up with the best ideas! Thanks so much. I am going to see if my kids want to make these with me on Thursday. Fun! And the short cut is awesome too! Safe journey to your Mom's! Hi! :) Thanks so much for the shout out about the tutorial! Aren't they so much fun to make? :) Love, love, LOVE your blog - So many fabulous ideas :) Thanks for all the great inspiration!